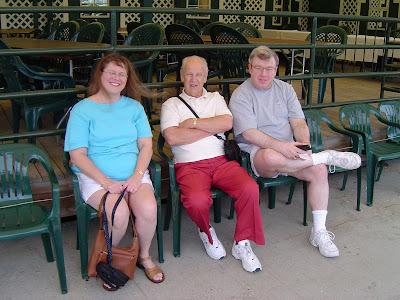 My father, Joe, was 81 years old when he passed away this past July 6th after a prolonged battle with lung cancer. He left behind four children and six grandchildren, all spread through the U.S. in Wisconsin, Washington, Kentucky, Oregon, and Iowa—and a brother and many other relatives in Germany. He was preceded in death by my mother, Margarete, by my baby brother Michael, by his parents, and all of his siblings but one. 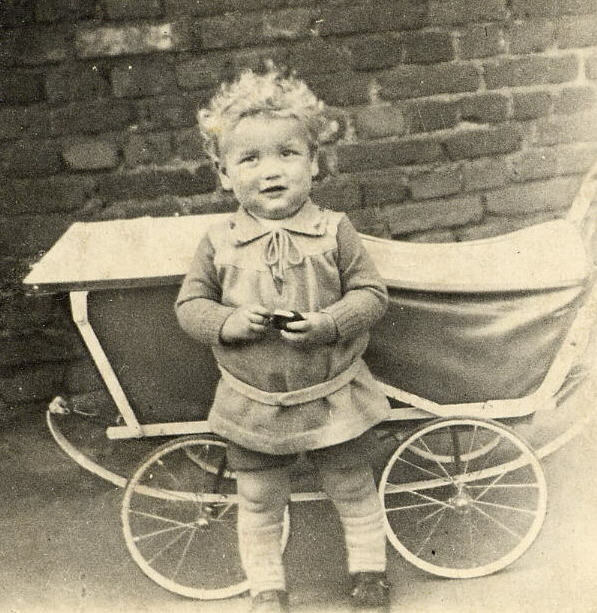 Joe grew up in Oberhausen-Sterkrade, Germany. 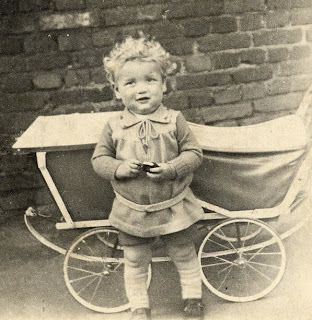 Born in Germany, Joe was only nine years old when World War II began. Like many children whose parents were concerned about their safety, he was sent south to the Alps until the worst conditions were past. There his adventurous spirit encouraged him to don his Lederhosen and climb high enough to pluck an Edelweiss flower that he pressed between the pages of his boyhood photo album. Naturally athletic, his favorite youth sports included soccer and hand ball. 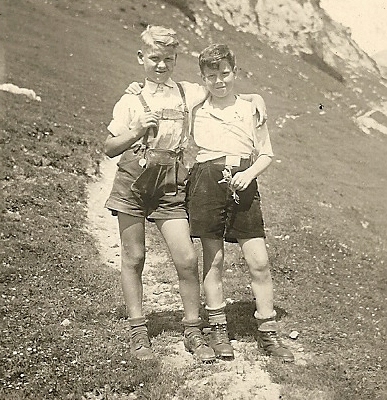 Joe (left) and his friend clutch their Edelweiss flowers. A thirst for new experiences caused Joe to board the S.S. Washington on June 22, 1951 from Hamburg, Germany to sail to the U.S. He was 21 years old when he arrived in New York on July 2nd with only two suitcases and an eager smile on his face. His sponsor was his Uncle Joe in Elm Grove, Wisconsin. He met the love of his life, Margarete, at a restaurant where she was waitressing. They married in 1954 at Camp Fort Leonard Wood, Missouri, where Joe served in the Sixth Armored Division. It was through his military service that he earned his U.S. citizenship. Joe felt a deep sense of patriotism for his adopted country. He was proud to be a Charter Contributor to The Statue of Liberty Ellis Island Foundation. My parents, both from Germany, became naturalized American citizens. Over time, Joe and Margarete discovered a mutual appreciation for classical music, ballroom dancing and singing, which they enjoyed at a German-American club called Harmonie. To some extent, these interests were an extension of Joe’s musical ability. As a teen, he and his friends formed a band in which he played the drums. During the early years of his marriage, he played an accordion. One Christmas when he was in his 70s, he bought himself an electronic keyboard, and for a while during his stay at The Courtyards at Luther Manor, he was a member of the bell choir. Joe dances with his sister, Hedwig, during a visit to Germany. 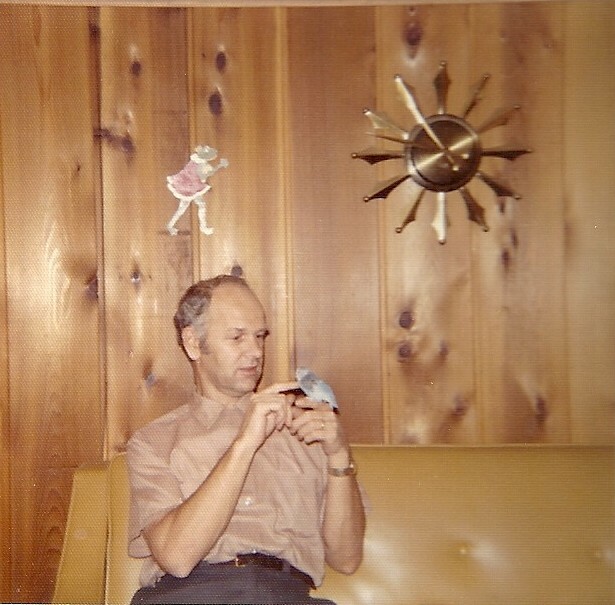 Joe was fascinated with technology from the time he arrived in the U.S. to the day he died. In 1958 he began taking flying lessons for his commercial pilot license and flew Cessnas; he continued to fly during his retirement years. In his 60s, he began building his own two-seater plane, and when he was 70 years old, Joe bought himself his first computer and taught himself how to use it. My brother, Mark, and I admire the plane our father flew. His earliest jobs in the U.S. took advantage of his tool-and-die maker skills at Kearney & Trecker and at Globe-Union in Milwaukee, Wisconsin. Following his military service he began attending Milwaukee School of Engineering, but left to seek full-time employment when Margarete became pregnant with their first child. Later, when his growing family moved to California, he supplemented his education with electrical engineering courses from Cerritos College. Eventually Joe advanced to management positions at Weiser Lock in southern California, and S-B Manufacturing Company, General Stamping and Stoelting in Wisconsin. 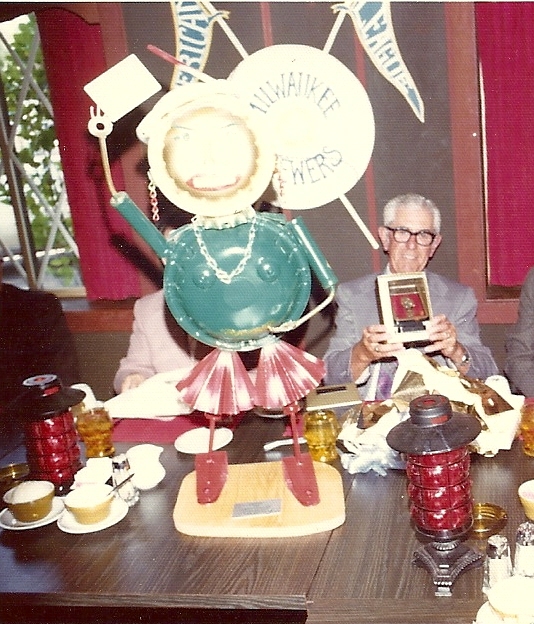 At S-B Manufacturing, where he was the plant manager, he often designed creative gifts for retiring employees made from Christmas tree stands and other items that the firm manufactured. Joe designed the standing figure from Christmas tree stands and screen door parts. 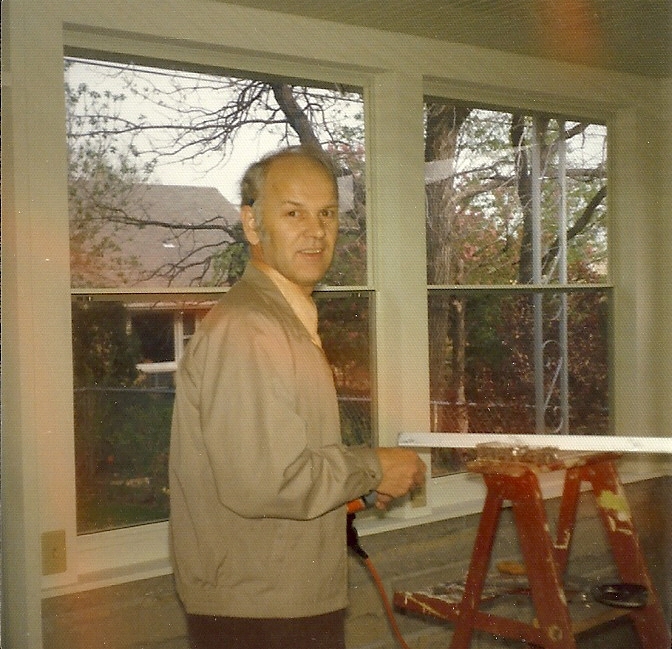 During the last years before retirement, Joe ran his own tool rental business. He also completed a Briggs & Stratton small engine repair course by correspondence, which enabled him to do lawn mower and snow blower repairs—in many cases free of charge for his neighbors. While residing at The Courtyards at Luther Manor, he worked in the wheelchair repair shop. Around the house, Joe was the ultimate do-it-yourselfer. He installed ceiling fans and kitchen appliances such as the dishwasher, oven and stove, re-keyed locks, and added a three-season patio room to the house. Joe even created his own aquariums from scratch for goldfish he raised. He transferred the fish to a back yard pond he designed, and added a fountain. My father always had a project on the backburner. Joe liked to live his life according to what he called the three Ps—patience, perseverance, and participation. He employed all three qualities in youth leadership roles as he became involved in his children’s activities: Mark and Rick’s Cub Scouts, Rick’s Indian Guides, and Monica’s Indian Princesses. He took sailing lessons with Judy and Mark, and snowmobile safety classes with Rick and Monica. He taught all of the children how to play chess and Canasta during grade school, constructed a detailed 3-D castle with Mark, and helped Judy thread her first sewing machine. He came home from work to get Monica’s hand out of the kitchen mixing bowl, and taught Rick how to clean the first fish he caught. He played with a pet parakeet and tussled with the family dog. The entire family looked forward to Joe’s Sunday morning waffle-baking marathons. Before my sister, Monica, was born, my father enjoyed couch time with (left to right) Mark, Rick and me. My father snapped this photo of his four children the first winter after we relocated to Wisconsin after living in southern California for 4-1/2 years (clockwise, beginning in the upper left corner): Judy, Mark, Rick and Monica. My father kept Tony, one of a series of parakeets the family kept, in his workroom. 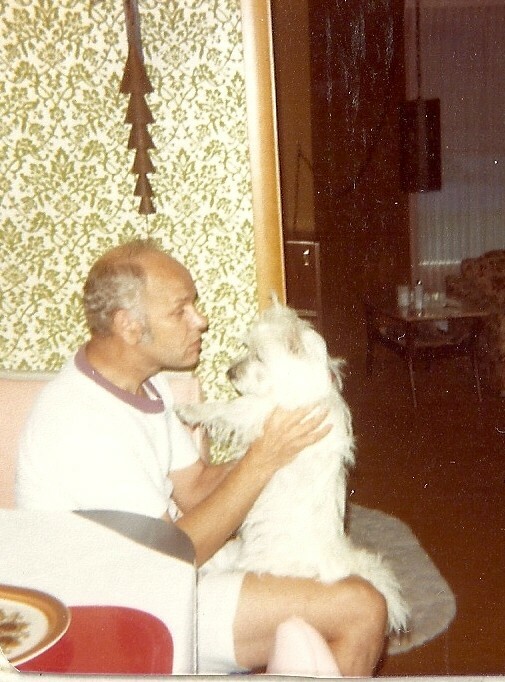 When I went to college, the family acquired Happy, a West Highland Scottish terrier. 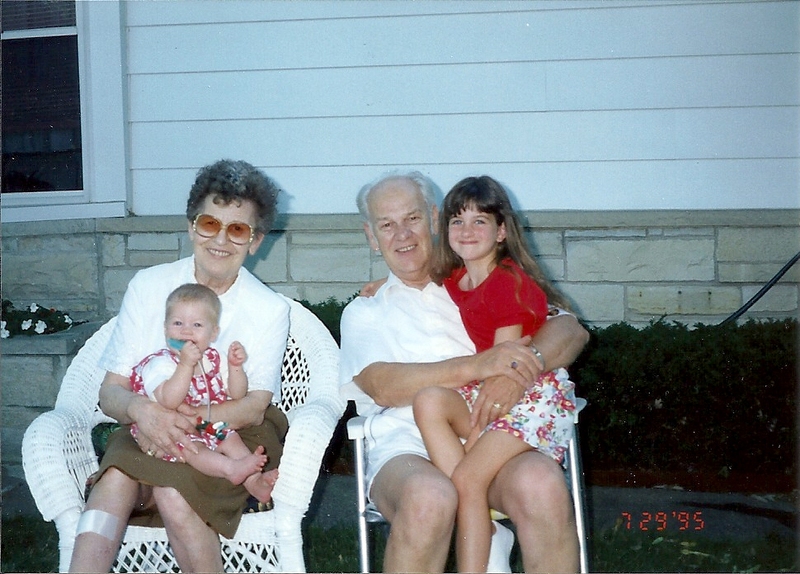 Joe was proud of all his grandchildren, took pride in their academic and athletic achievements, and loved sharing stories about them with his visitors. He enjoyed playing with his grandchildren as they grew up. 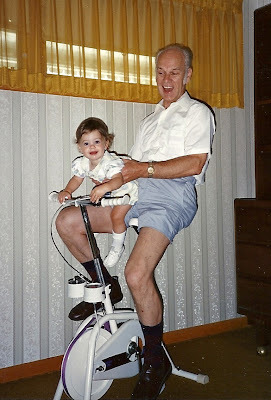 Joe bicycles with his granddaughter, Kat. Our son, David, and Opa enjoy a tender moment. 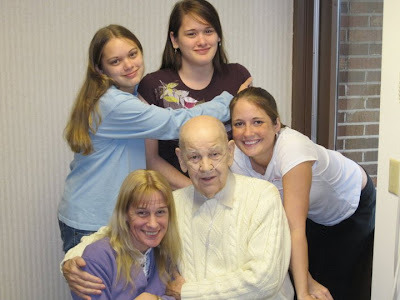 My sister, Monica (next to my dad), visited my father last year with her daughters (left to right): Janelle, Bethany and Adrienne. Margarete and Joe enjoy a visit from their Washington granddaughters (left to right), Kris and Kat. Among the more recent highlights of his life was a cross-country RV trip he shared with his brother Herbert and sister-in-law Doris to visit all of his children and their families. He visited Herbert and Doris in Germany, and accompanied them on a trip to Rome, where he was part of the Pope’s audience. He attended the wedding of his niece Regina and husband Daniel in Germany, and not even a year ago danced with his granddaughter Adrienne at the Chicago wedding of grandson David and his wife Penny. 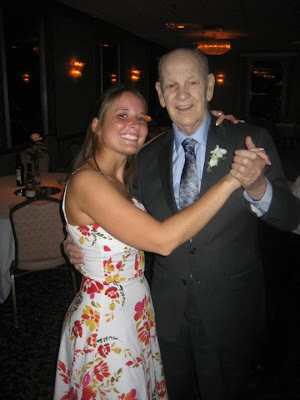 Granddaughter Adrienne dances with "Opa" at our son's wedding. Volunteering was as natural to him as breathing. For 11 years, Joe delighted in teaching religious education to 7th graders at St. Agnes Parish in Butler, Wisconsin. “They don’t know if they’re fish or fowl,” he used to say, “and I find that refreshing.” Because algebra and trigonometry were a daily part of his work day, it was easy for him to volunteer to tutor adults in math, which he did as part of an adult literacy project. He delivered meals for the local Aging and Disability Resource Center, and volunteered for the Wisconsin Nursing Home Ombudsman Program. For a while at Luther Manor, he ran the audio-visual equipment when the first-Friday-of-the-month Mass was broadcast throughout the residential community. Joe is recognized for his service as Volunteer Ombudsman for the Wisconsin Nursing Home Ombudsman Program. He had a prodigious store of jokes he liked to tell, and retained his sense of humor despite the challenges of his illness. “Spass muss sein” (you gotta have fun), he would tell everyone. Joe didn’t like to be rushed, so it was not unusual to hear him say, “We’ll cross that bridge when we come to it.” He has crossed the Eternal Bridge now to be with his Father, where he will no doubt continue to tell jokes. Joe returned to the Alps in recent years to visit boyhood haunts.